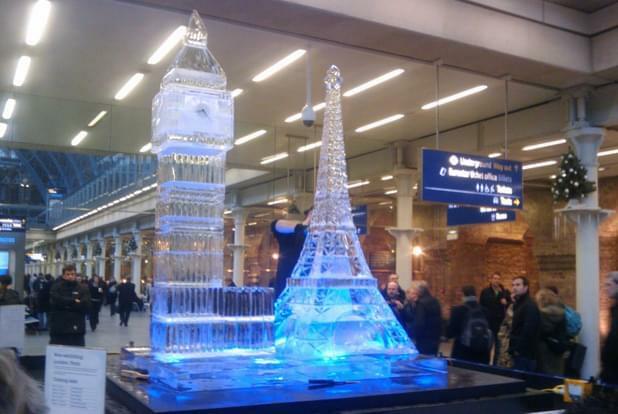 The Creative Brief: To create a series of large scale ice installations, covering a range of traditional Christmas themes and current events, throughout December. To create PR for St Pancras International, to engage audiences with an innovative approach, and demonstrate St Pancras International’s commitment to delivering new and innovative ways to engage visitors and commuters. To ensure there is minimum disruption as the station is open 24 hours. To undertake all within strict Health and Safety and Security guidelines. To execute within budget, and deliver results. 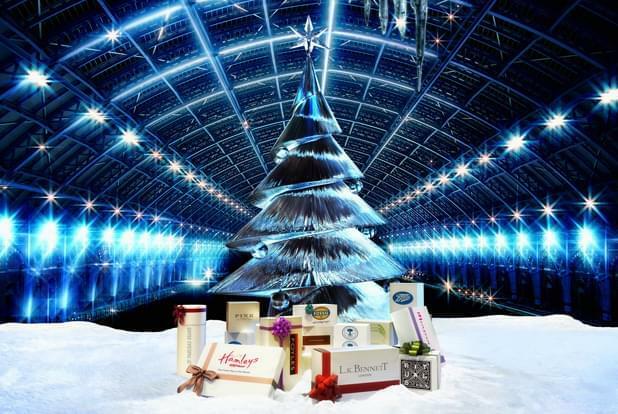 Innovative Solution: The Icebox, working with Brand & Deliver, St Pancras Intl marketing team & creative and marketing consultants Ruby designed 9 pieces to fit within various themes of Christmas, Current Events, Towards 2012, and London / Paris. The first installation, a contemporary Christmas Tree, weighed approximately 4 tonnes and was created from over 60 blocks of ice. 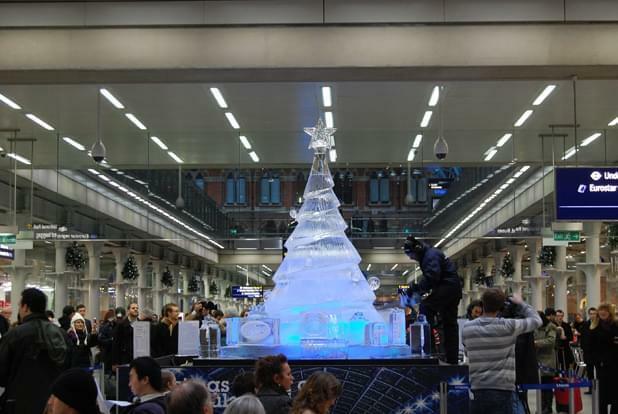 The tree was adorned with real ice baubles and dozens of ‘ice presents’ displayed underneath the tree featuring the logos of retailers within the station. This was by no means the largest of the nine sculptures, both in terms of volume of ice and press coverage. On the weekend the X- Factor winner was announced The Ice Box sculptors installed a ‘larger than life size’ replica of the four X-Factor Judges. This impressive work of art was broadcast on ITV and the BBC, as well as dozens of news articles online. To further engage the public, The Icebox designed an ice Santa’s Sleigh, complete with ice Reindeer. 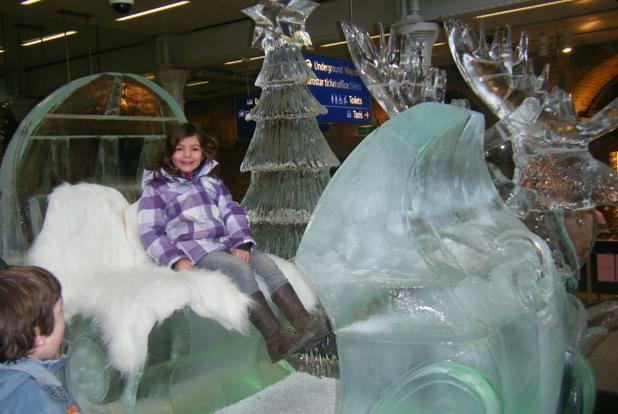 Shoppers and commuters were invited to sit on the fur covered seat, touch the ice and take photos. Santa’s Sleigh was enormously popular with hundreds of people over the two days interacting with the sculpture. Throughout the promotion, the public voted for a design of their choice to be created in the final week before Christmas. Thousands of people voted online and through competition boxes placed around the station. With just a few days lead time an elegant ice Angel was revealed to the public on Monday morning. Working with Brand & Deliver and Ruby, The Icebox managed the installation of all production elements of staging, lighting, staffing and signage. Dynamic Result: The Icebox exceeded client expectations, both in the high standard of the work, creativity and enhancing an already spectacular venue. Providing flawless execution, a dedicated project manager, and with crew onsite 24 hours. Feedback from retailers and St Pancras International confirmed an uplift in retail sales and numbers of retained visitors, a key objective of the campaign. Quality media coverage was generated for St Pancras International from live TV and press. Visitors posted photos and stories daily on many social media sites. Overall the event was extremely successful and provided substantial value and return on investment.